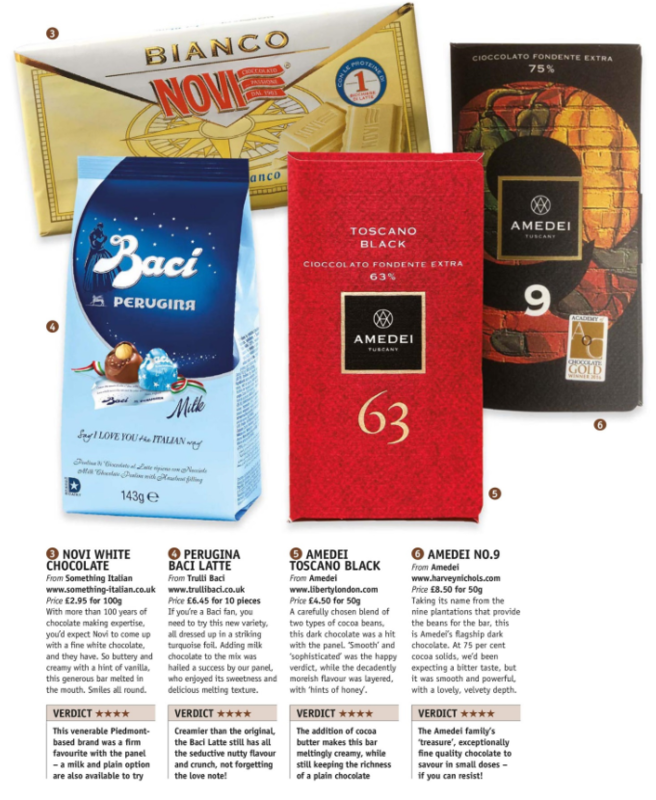 This month ITALIA!, put some fine Italian chocolate treats to the test which included our fabulous Baci Perugina Latte range – well, it’s a difficult job but someone had to do it… Read on for the round-up of their favourites. Over the last few decades, Italy has established itself as one of the leading nations worldwide for the production of fine chocolate, making significant inroads, primarily in the gourmet market. Our selection includes the celebrated Baci by Perugina – which has gained tremendous popularity stretching far beyond the confines of Italy, while other names are coming to prominence too, such as Amedei from Tuscany. Hosts of other confectioners abound, all concocting sublime treats for chocoholics, available in the UK online or from speciality delis. With premium quality products, remember that less is more, and when it comes to luxurious chocolate, it is often worth that extra investment to ensure an unrivalled satisfaction. Whether you feel like treating yourself to a guilty pleasure or you need inspiration for a gift, read on to find out more. If you’re a Baci fan, you need to try this new variety, all dressed up in a striking turquoise foil. Adding milk chocolate to the mix was hailed a success by our panel, who enjoyed its sweetness and delicious melting texture. Creamier than the original, the Baci Latte still has all the seductive nutty flavour and crunch, not forgetting the love note.